Oblivion obsession: time to start playing melodica! I have been obsessed for some time with Piazzolla’s beautiful tango piece “Oblivion”. I was planning to perform it some time on flute, but today, by accident, I decided that I want to play it on my melodica instead! During the rehearsal, I played both flute and Irish flute, depending on the key. Afterward, while socializing, I happened to ask about the ukuleles that some people had. I mentioned that I still hadn’t gotten around to learning ukulele, despite having intended to and bought a soprano a long while back. I just found it very hard to get started with my first string instrument, and other things came up. I joked about the other instruments I have that I don’t play, including my melodica. Lynette said in all seriousness that I was welcome to play it at the Holiday Ball. So after I got home, I pulled out the melodica. What is the melodica good for? 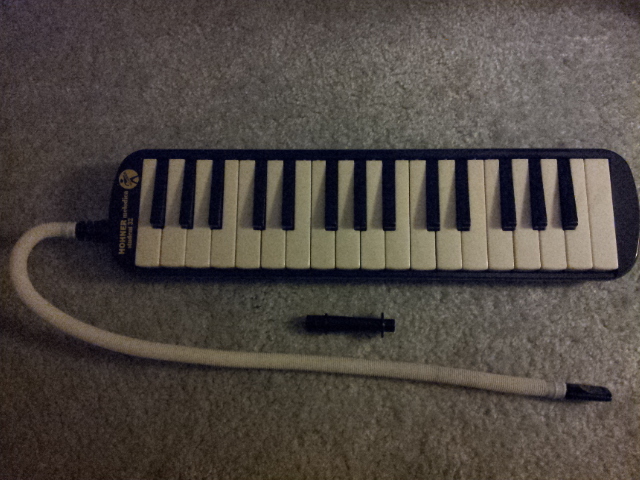 It turns out that I don’t think the melodica works well at all for the Holiday Ball music, actually. The instrument is not best at fast runs. But, since I had the instrument out: I decided to try playing it in place of flute for some music I’ve been working on, such as tango and bossa nova. And I discovered that melodica works great for these kinds of music! Then one thing led to another, and I was searching for covers of various songs on melodica on YouTube, and found quite a lot of cool performances by people. So now I’m completely serious about preparing to use my melodica in actual musical performances. Frankly, a lot of music I’ve been playing on flute sounds better with a darker, reeded instrument such as the melodica. For example, I’ve been playing jazzy bossa nova that I think really works best with a saxophone, but I don’t (yet!) play saxophone. The melodica works well as a substitute. In tango, of course, a bandoneón is the traditional instrument, and accordions are commonly used instead. Here, again, the melodica is great, for the melody line anyway. Finally, other music that involves accordions or harmonicas work great with melodica as well. Since I am confessedly obsessed with “Oblivion”, here are some performances I found moving or otherwise useful. Wow. Wow. Milva singing French lyrics, Piazzolla himself on bandoneón! A Japanese recorder quartet, Sekishi Recorder Quartet. Very nice! If you are a tango fan, make sure to read Daniel Pucci’s great article on tango dance connection. It is consonant with my own dance philosophy as well as music philosophy! By accident, I have rediscovered the melodica, and now intend to work on it as a serious melodic instrument! I put up more videos I found of “Oblivion” while thinking back to 2013 when I did play it on flute after all.